"It's like déjà vu all over again." Mark Henkel, National Polygamy Advocate and founder of the TruthBearer.org organization, responds to the news and is available to media for comment. Old Orchard Beach, MAINE, June 25, 2017 - Pro-Polygamy.com - Mark Henkel is the National Polygamy Advocate ™ of NationalPolygamyAdvocate.com. For over 20 years, educating as a professional speaker, writer, and proven major-media expert giving countless interviews, Mark Henkel has been the established voice of the National Polygamy Rights Movement for Unrelated Consenting Adults. Representing the broader demography of all forms of polygamists throughout America (beyond Utah and Mormonism), Henkel's proven experience with the media about polygamy has helped bring the movement to where it is today. On June 14, 2017, FLDS (Fundamentalist Latter Day Saints) cult leader Lyle Jeffs - a fugitive wanted by the FBI for this last year - was found and captured in South Dakota. He was not wanted on charges for polygamy. "Here we go again. Most pro-polygamists around the country are unquestionably glad that fugitive Lyle Jeffs has been apprehended. Lyle Jeffs is the brother of Warren Jeffs who replaced his now-jailed brother to lead the FLDS. Almost 11 years ago, we adamantly voiced our exact same opposition to that cult and its then leader, Warren Jeffs, who had also been on the lam back in 2006. * and to which I repeatedly informed the media of the corrected pro-polygamy perspective. Pro-polygamists were/are glad Jeffs was caught. "As I said in 2006, I say again now in 2017. The FLDS is not a 'polygamist sect' and neither of the Jeffs brothers is a 'polygamist leader.' Around the country, normal otherwise-law-abiding consenting adult pro-polygamists of all forms (whether Christian Polygamy, Secular Polygamy, other forms, or even independent Mormon Polygamy) have always opposed the FLDS, the Jeffs brothers, and the specific non-polygamy crimes with which both were charged. "The national polygamy movement has also always clarified that the FLDS has vastly more in common with the 'mainstream' LDS ('Mormons') than any shared commonality with Unrelated Consenting Adult Polygamy (UCAP) around the country. As most media reports additionally include a caveat that the 'mainstream' LDS is not associated with the FLDS, a likewise caveat should - and must - also be added: UCAP polygamists are not associated with the Jeffs brothers and/or FLDS either. With the same vehemence that the LDS rejects the FLDS, so too does the National Polygamy Rights Movement for Unrelated Consenting Adults likewise reject the FLDS. If accuracy requires not labelling the Jeffs brothers as 'Mormon leaders,' even better accuracy mandates not labelling them as 'polygamist leaders' either. 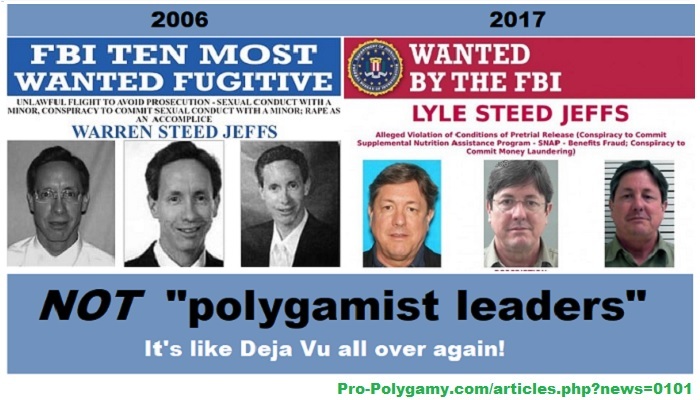 "Just as history repeats 'like déjà vu all over again,' I repeat this too: around the country, normal pro-polygamists are absolutely glad that fugitive Lyle Jeffs was caught."